Cell-site simulators, also known as Stingrays or IMSI catchers, are devices that masquerade as legitimate cell-phone towers, tricking phones within a certain radius into connecting to the device rather than a tower. Cell-site simulators operate by conducting a general search of all cell phones within the device’s radius, in violation of basic constitutional protections. Law enforcement use cell-site simulators to pinpoint the location of phones with greater accuracy than phone companies. Cell-site simulators can also log IMSI numbers (unique identifying numbers) of all of the mobile devices within a given area. Some cell-site simulators may have advanced features allowing law enforcement to intercept communications or even alter the content of communications. Generally, there are two types of device used by law enforcement that are often referred to interchangeably: passive devices (which we will call IMSI catchers), and active devices (which we will call cell-site simulators.) Passive devices, as a rule, do not transmit any signals. They work by plucking cellular transmissions out of the air, the same way an FM radio works. They then decode (and sometimes decrypt) those signals to find the IMSI of the mobile device and track it. Active cell-site simulators work very differently from their passive cousins. Cellular devices are designed to connect to the cell site nearby with the strongest signal. To exploit this, cell-site simulators broadcast signals that are either stronger than the legitimate cell sites around them, or are made to appear stronger. This causes devices within range to disconnect from their service providers’ legitimate cell sites and to instead establish a new connection with the cell-site simulator. Cell-site simulators also have passive capabilities, such as identifying legitimate cell sites and mapping out their coverage areas. For the purposes of this article we will primarily discuss active cell-site simulators. It is difficult for most people to know whether or not their phone’s signals have been accessed by an active cell-site simulator, and it is impossible for anyone to know if their phone’s signals have been accessed by a passive IMSI catcher. Apps for identifying the use of cell-site simulators, such as SnoopSnitch, may not be verifiably accurate. Some more advanced tools have been built, which may be more accurate. For instance, security researchers at the University of Washington have designed a system to measure the use of cell-site simulators across Seattle. There are other researchers, including those at EFF, looking into this further. Data collected by cell-site simulators can reveal intensely personal information about anyone who carries a phone, whether or not they have ever been suspected of a crime. Once your cellular device has connected to a cell-site simulator, the cell-site simulator can determine your location and read identifying data such as IMSI or ESN numbers directly from your mobile device. It can also intercept metadata (such as information about calls made and the amount of time on each call), the content of unencrypted phone calls and text messages and some types of data usage (such as websites visited). Additionally, marketing materials produced by the manufacturers of cell-site simulators indicate that they can be configured to divert calls and text messages, edit messages, and even spoof the identity of a caller in text messages and calls. Police can use cell-site simulators to try to find a suspect when they already know their phone’s identifying information, or to scoop up data on anyone in a specific area. Some cell-site simulators are small enough to fit in a police cruiser, allowing law enforcement officers to drive to multiple locations, capturing from every mobile device in a given area—in some cases up to 10,000 phones at a time. These indiscriminate, dragnet searches include phones located in traditionally protected private spaces, such as homes and doctors’ offices. Law enforcement officers have used information from cell-site simulators to investigate major and minor crimes and civil offenses. Baltimore Police, for example, have used their devices for a wide variety of purposes, ranging from tracking a kidnapper to trying to locate a man who took his wife’s phone during an argument (and later returned it to her). In one case, Annapolis Police used a cell-site simulator to investigate a robbery involving $56 worth of submarine sandwiches and chicken wings. In Detroit, U.S. Immigration and Customs Enforcement used a cell-site simulator to locate and arrest an undocumented immigrant. Police have even deployed cell-site simulators at protests. The Miami-Dade Police Department apparently first purchased a cell-site simulator in 2003 to surveil protestors at a Free Trade of the Americas Agreement conference. Cell-site simulators are used by the FBI, DEA, NSA, Secret Service, and ICE, as well as the U.S. Army, Navy, Marine Corps, and National Guard. U.S. Marshals and the FBI have attached cell-site simulators to airplanes to track suspects, gathering massive amounts of data about many innocent people in the process. The Texas Observer also uncovered airborne cell-site simulators in use by the Texas National Guard. A recent Congressional Oversight Committee report called on Congress to pass laws requiring a warrant before using cell-site simulators. Some states, such as California, already require a warrant, except in emergency situations. Other sellers of cell-site simulators include Atos, Rayzone, Martone Radio Technology, Septier Communication, PKI Electronic Intelligence, Datong (Seven Technologies Group), Ability Computers and Software Industries, Gamma Group, Rohde & Schwarz, Meganet Corporation. Manufacturers Septier and Gamma GSM both provide information on what the devices can capture. The Intercept published a secret, internal U.S. government catalogue of various cellphone surveillance devices, as well as an older cell-site simulator manual made available through a Freedom of Information Act request. Cell-site simulators invade the privacy of everyone who happens to be in a given area, regardless of the fact that the vast majority have not been accused of committing a crime. The use of cell-site simulators have been shrouded in government secrecy. Police have used cell-site simulators to track location data without a warrant, by deceptively obtaining “pen register” orders from courts without explaining the true nature of the surveillance. In Baltimore, a judge concluded that law enforcement had intentionally withheld the information from the defense, in violation of their legal disclosure obligations. For a while, police departments tried to keep the use of cell-site simulators secret from not just the public but also the court system, withholding information from defense attorneys and judges—likely due to non-disclosure agreements with Harris Corporation. Prosecutors have accepted plea deals to hide their use of cell-site simulators and have even dropped cases rather than revealing information about their use of the technology. U.S. Marshalls have driven files hundreds of miles to thwart public records requests. Police have tried to keep information secret in Sarasota, Florida, Tacoma, Washington, Baltimore, Maryland, and St. Louis, Missouri. In light of this secrecy, the FBI told police officers to recreate evidence from the devices, according to a document obtained by the nonprofit investigative journalism outlet Oklahoma Watch. Cell-site simulators often disrupt cell phone communications within as much as a 500-meter radius of the device, interrupting important communications and even emergency phone calls. Cell-site simulators have been shown to disproportionately affect low-income communities and communities of color. In Baltimore, the use of cell-site simulators disproportionately impacted African-American communities, according to a map included in an FCC complaint that overlaid where Baltimore Police were using stingrays over census data on the city’s black population. Cell-site simulators rely on a vulnerability in our communications system that the government should help fix rather than exploit. Law enforcement must minimize the collection of data from people who are not the targets of the investigation. We filed a Freedom of Information Act lawsuit to expose and shine light on the U.S. Marshals Service’s use of cell-site simulators on planes. Along with the ACLU and ACLU of Maryland, we filed an amicus brief in the first case in the country where a judge threw out evidence obtained as a result of using a cell-site simulator without a warrant. We were original co-sponsors of the California Electronic Communications Privacy Act (CalECPA), along with the ACLU and the California Newspaper Publisher Association. This bill requires California police to get a warrant before using a cell-site simulator. 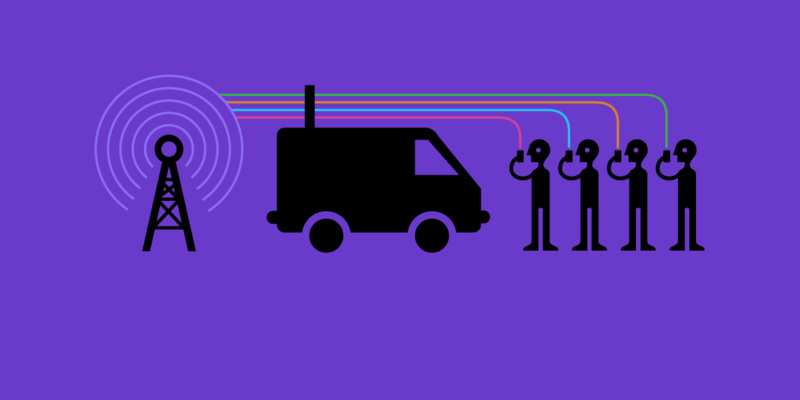 Any evidence obtained from a cell-site simulator without a warrant is inadmissible in court. EFF supported S.B. 741, which requires transparency measures regarding the use of cell-site simulators. We are in the process of collecting these policies. EFF has been investigating the use of cell-site simulators against Water Protectors and their allies at the Dakota Access Pipeline at the Standing Rock Sioux Reservation in North Dakota. We are currently doing further research on the technical aspects of cell-site simulators.